Donald A McCain M.D. Ph.D, F.A.C.S. Dr. Donald A McCain has focused his career on the treatment of melanoma and other forms of cancer. As a board certified surgical oncologist, he specializes in the surgical management of melanoma and cancerous tumors. Dr. McCain, a Fellow of the American College of Surgeons, is a recognized as a leader in his field. He is, therefore, able to offer his cancer patients the most advanced and high quality care possible. He presently holds an academic appointment of Assistant Clinical Professor of Surgery at UMDNJ-New Jersey Medical School. He concurrently serves as the Chief of Surgical Oncology and Vice Chairman of the John Theurer Cancer Center at Hackensack University Medical Center. Dr. McCain conducts research and frequently contributes to peer-reviewed publications. His other areas of expertise include the treatment of gastric cancer, colorectal cancer, hepatobiliary cancer and sarcomas. Dr. McCain received his Bachelor of Science in chemistry from the City University of New York and his Ph.D. in molecular biophysics from Albert Einstein College of Medicine. 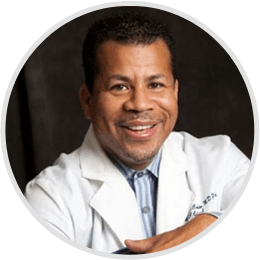 After earning his doctorate, Dr. McCain completed his medical degree at Albert Einstein College of Medicine and his surgical residency at the Mount Sinai Medical Center in New York. Following a surgical oncology fellowship at the world renowned Memorial Sloan-Kettering Cancer Center, Dr. McCain joined the Hackensack University Medical Center. Dr. McCain holds memberships in several highly respected national and regional professional organizations, such as the American Hepato-Pancreato-Biliary Association. Listed in the prestigious Castle Connolly’s Top Doctor: New York Metro Area 2015, Dr. McCain is committed to excellence in cancer treatment. His dedication to his profession and his patients is reflected in the numerous awards he has received including: America’s Top Physician 2007; America’s Top Oncologists – Surgical Oncologist 2010; Nurse’s Choice – Top Doctors 2010, New Jersey State Nurses Association; America’s Top Surgeon 2013; Top Doctor for Women’s Health 2013 – Inside Jersey & Castle Connolly; Castle Connolly Regional Top Doctors 2015; and Inside Jersey Top Doctors for Cancer 2015, among others.